Realtors in the month of October sold 3,200 single-family homes at a median price of $165,000. That’s $5,000 lower than July, the peak of housing boom, but 23% higher than last August. While some experts expected prices to slow down after July, Tampa Bay posted the biggest year-over-year price jump since the housing crash and some of the biggest gains in the state of Florida. What are the underlying reasons behind the increase? Tight supply of homes for sale. The typical home last month went under contract in 29 days. More homes are selling the conventional way, without foreclosures or short sales. Non-distressed homes accounted for 71% of local sales in October, the highest share in five years. These price gains have helped to restore equity to thousands of area homeowners who owed more on their loans than their houses were worth. New CoreLogic data shows that the ratio of “underwater” homes fell from 41% to 33% since the first of the year. Recovering prices also knocked out investment buyers who once dominated the market by gobbling up homes at rock bottom prices. Cash sales fell in August for the eighth month in a row to only 40% of sales – down from 54% in January. If you’ve been considering buying a home and are already pre-approved, here are a few reasons why shopping for one during the holiday season can benefit you. Like many businesses, the holiday season can cause things to slow way down. That’s often the case for real estate – however, that doesn’t mean you won’t find eager sellers hoping you’ll make an offer on their homes. Even though there are parties, kids’ social activities and end-of-the-year work commitments, real estate sellers are still ready to let you step inside their homes to see if you’ll find one is a good fit. When real estate slows down, that means mortgages slow down. So this is a good time to get a mortgage. There’s a chance your loan will move through the process faster. Why?? If there are fewer loans to process, yours can move along faster. 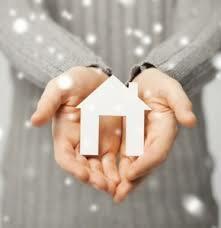 Home prices are often lower in December than in other months. If you wait until the spring, you’re likely to wish you’d, at least, done some house-hunting. Industry reporting services often show home appreciation slows in the fourth quarter, making homes more affordable. Since it is a busy time of year, you may find that there aren’t many buyers shopping for homes, which is exactly why this may be a good time to house-hunt. Fewer buyers could mean a great opportunity for you to make an offer and negotiate a favorable price. However, fewer homes to choose from could mean you have more difficulty finding precisely what you’re looking for. Conversely, too many homes can also create a no-win situation by confusing and overwhelming you.